AGC Systems company designed an innovative system for improving air-tightness in IT rack cabinets. The system allows for maintaining a proper concentration of extinguishing agent released by AGC Master® and AGC Slave® Extinguishing Apparatuses. The solution can be applied in cabinets conforming to IP 40(or higher) air-tightness standard. Fig. 1. Main elements of the automatic extinguishing and air-tightening system. 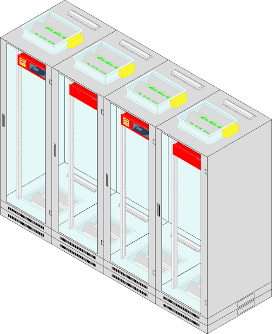 All IT and technical rack cabinets, and distribution boards have mostly two surfaces potentially endangered with air-leakage: ventilation gap used for cooling of the cabinet with cold air is located at the bottom of the cabinet, whereas ventilators or a perforated sealing plate are located on the top of cabinet. During extinguishing procedure the agent easily escapes into the outside of the cabinet through gaps described above. As a result effective extinguishing of fire is not possible due to the insufficient amount of the extinguishing agent (the concentration of extinguishing agent in the cubic space is insufficient to extinguish fire). Our company applies two multi-bladed air dampers installed at the top and at the bottom of cabinets. During the extinguishing procedure air dampers close and increase air-tightness of both surfaces (fig. 1). Every air-damper is attached tightly to the surfaces at the top and at the bottom of the cabinet. After blades of the air-damper close, the interior of the cabinet is air-tightened, which is crucial for the extinguishing agent to maintain proper concentration needed to extinguish fire. The air-tightness of the cabinet itself is also important because closing of the air dampers is effective only when cabinet’s construction conforms to IP 40 (or higher) air-tightness standards. Both air-dampers are fitted with electric actuators whose opening and closing is controlled by AGC Master Extinguishing Apparatus®. Blades in both air-dampers are open in the standard mode of cabinet’s operation, however, during fire outbreak and initiation of extinguishing procedure by AGC Master Extinguishing Apparatus® (both smoke detectors inside the apparatus detect fire), the apparatus transmits a signal to actuators which results in closing of the air-damper’s blades. The blades are closed after 15 seconds. After the extinguishing procedure is over and the system is restarted, blades in the dampers will open again enabling the circulation of the air in the cabinet. Additional air-tightening of top and bottom surfaces of the protected cabinet with the use of air-dampers (in the cabinet conforming to IP40 air-tightness standards) allows for maintaining a necessary concentration of the extinguishing agent released by AGC Master Extinguishing Apparatus®. As a result the air-tightness of the cabinet is sufficient to maintain a proper concentration of the extinguishing agent. It is important to notice whether cable bushings are properly air-tightened. Cable bushings cannot increase the air-leakage of the cabinet if the cabinet is to maintain air-tightness at IP40 level. Cables can be inserted into the cabinet through every surface with the use of PG type stuffing-boxes varied in diameters or other air-tightening products. Stuffing-boxes are installed on a special plate provided by the producer of the cabinet. The plate with PG type stuffing-boxes is than installed in the designated surface of the cabinet. Plates are additionally air-tightened with a gasket which guarantees the proper air-tightness of the cabinet (fig. 2). Fig. 2. Plate with PG type stuffing-boxes. In the case the set of cabinets joined sideways creating a joint cubic space is protected it is possible to apply AGC Master® and AGC Slave Extinguishing Apparatuses® with air-tightening system (fig.3). Fig. 3. The set of cabinets with fire extinguishing system fitted with air-tightening elements.